A whale starts to smoothly cleave through the water, swimming down to the dark blue sea while a girl is firmly grabbing its back. As a Maori, she was named after a mythical leader, Paikea, who is believed to have built the community after arriving there, riding on a whale. Despite the implication of her name, that she will grow up to be a leader, she is excluded from the special training just because she is a girl. How will the blooming child overcome the heavy rainfall of discrimination? Receiving the Best International Film Award at the Independent Spirit Awards in 2004, Whale Rider (2002) has an appealing story with dramatic incidents. Paikea’s grandfather, Koro, was in great disappointment after her mother and twin brother died immediately after birth since his grandchild should have been a boy who could be the chief. Heartbroken by this situation and the unsympathetic reaction of Koro, Paikea’s father flies to Germany. Although Paikea could not undergo the training by Koro to become a leader, she trains hard with the help of her friend and other family members. 44 most tearful scene, when she sobbingly gives a presentation for her grandfather in the school’s recital even though he does not attend. Getting credit for her performance, she received the Best Young Performer Award at the Critics' Choice Movie Awards in 2004. Whale Rider is focused on Paikea’s thoughts and feelings, considering that she is the narrator and her close-up shots in particular account for a large portion of the close-ups. However, the film also goes on to show other characters’ stories to make them realistic. For example, Koro is in the position of antagonist, but it turns out that he actually had affection for his grandchild as well. He helped Paikea commute to school on his bicycle every day and had meaningful conversations with her. In spite of his discriminative attitude to her, his internal conflicts about his small affection and strong obsession with tribal traditions make Koro a well- rounded character. Koro’s anxiety about collapsing traditional values can be explained by the coexistence of tradition and modernity described in the film. Although it mainly focuses on a tribal myth in New Zealand, Korean audiences today do not feel much sense of distance because the lifestyle of residents including food, clothing and shelter is similar to that of contemporary Koreans. Meanwhile, Koro’s class for boys shows tribal traditions. 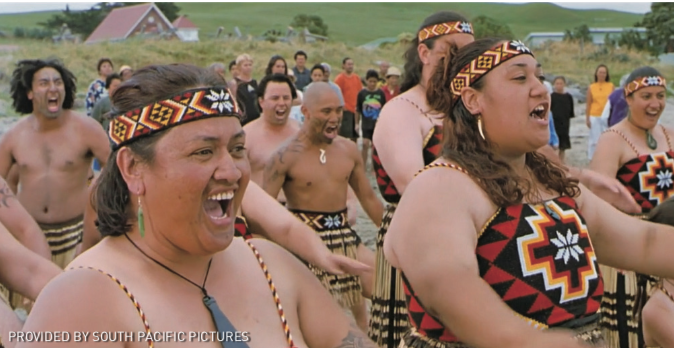 Wearing the traditional clothing and make-up, boys beat their chests while speaking in Maori. Such unfamiliarity and the earnestness of the boys shown in their shining eyes also deliver interest and awe to audiences. Furthermore, a dreamlike atmosphere is formed by the visual and auditory presentation of whales in the sea. 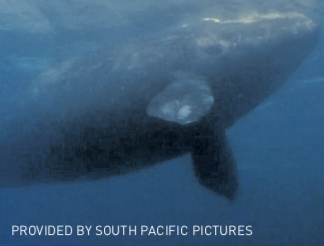 The first background music in the film, sounding rather mysterious without the lyrics, is used to encircle the whale’s silhouette. When the director shoots the whale in the water against the sun to show its shadow figure quite a few times, the audience can feel a sense of unity as well as curiosity with the same music. Another method was employed to show the whales on the sandy beach. Tangible replicas, instead of computer graphics (CG), enabled for the actors to be immersed in their emotions better. Such effective methods vitalized the mythical topic which otherwise could have seemed childish. Paikea trains herself to be capable of riding the whale like her ancestors did. Although Koro excluded her from his lectures to be the chief, her grandmother and uncle secretly teach her how to battle using a spear. Another assistant was a boy whose name is Hemi. “You could sit on the back,” he says with favor to Paikea who could not even step into the field. In the patriarchal and authoritarian society, such encouraging words can give power to the oppressed. Because others did not remain silent and stood out to offer help to Paikea, she could come out of the rains of discrimination and get on the whale. “Weave together the threads of Paikea, so that our line would make us strong,” Koro says. However, his focus on the complete twine is a narrow interpretation. In fact, a society can be sturdy when all members who are respectively a strand of the same ancestor join force. Contrary to Koro’s fear, his tribe canoes with the traditional ritual for the first time in their generation after Paikea gets acknowledged by Koro. Her father comes back to complete building the canoe, which implies that people who once dreamed to leave the place are settling again. Such a happy ending should not be only that of the movie; just as in the film, people should try to face the issues of discrimination and understand each other. Korean society has suffered from hostile frames about gender, race or ideology. Because such frames provoke discrimination and hamper objective judgments, many would agree that getting rid of them in society is necessary. The community becomes more united and inner conflicts of the members disappear when the individuals can get the proper credit that they deserve. Whale Rider allows audiences to be absorbed in the film with its eventful storyline full of visual and auditory beauty. Moreover, it is not only interesting but also instructive and makes its viewers ponder the message the director is trying to convey. Like Paikea and Hemi, contemporary people are recognizing problems about bias and persecution that are prevalent in society. Though it can rain hard sometimes, the weather must change. When everyone cooperates, the sun will shine on the community.